Warsop Main colliery (Nottinghamshire pit in North Derbyshire Area of NCB) - 2 shafts at 19 feet (5.8m) dia prepararation 1893 and sunk to 529.3 yards (484m) deep in 1894 - 1895 through 240 different strata that included 34 seams of coal in the concealed measures by the Staveley Coal and Iron Co. The colliery was situated near to the border of Nottinghamshire and Derbyshire at Warsop Vale west of Market Warsop and working the Top Hard seam initially. 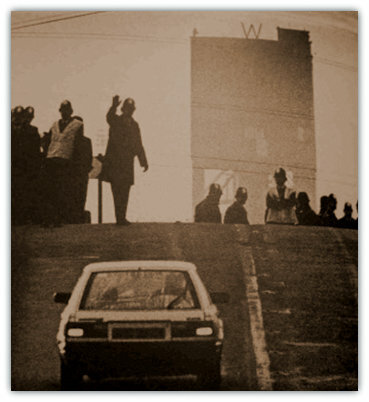 The colliery was closed on 25th August 1989 after 95 years and known locally as Warrsup. Shaft positions: SK56NW, No1 shaft 454733, 368177, No2 shaft 454693, 368167, sunk to the Top Hard seam. In 1897 there was a 5 months strike over pay rates. The Lancashire, Derbyshire and East Coast railway was built to transport the coal away. The first sod was cut by Mrs Arkwright of Sutton Scarsdale on 7 Jun 1892 and was open for freight 16 Nov 1896 and passenger traffic 8 Mar 1897. Called the Chesterfield and Lincoln line by 1918 and after nationalisation of the railways in 1948 was part of the LNER region. In 1902 the pit was closed for a while whilst alterations and repairs were carried out. There were 1,200 men and boys employed at the time and most were given notice. The resumption of working led to around 18,000 tons a week being produced with a record tonnage of 19,702 tons in Jan 1908 with a World record tonnage of 3,912 tons for a 12 hour period, the manpower by now had risen to 2,700 men and boys and output was an average of 21,000 tons per week. There was a strike by the boys in 1909 owing to no snap time being given under the new 8 hour system. Ponies were used to gang coal and supplies. It was resolved after a short time as it affected everyone as no coal was produced. The wages bill was £250,000. 600 named wooden railway wagons were used. At that time, 19 miles of roadways open and 18 miles of rope haulage and 3 miles of face. In 1914 around 400 men enlisted in the forces for the First World War and the output fell by 4,000 tons per week. The workings were now extending far from the pit bottom, and in 1917 in the Windmill travelling road a rope-hauled manrider consisting of 10 cars each carrying 12 men for 1,000 yards (915m) was installed. There was a 2 day strike by 40 enginemen and firemen in 1919. 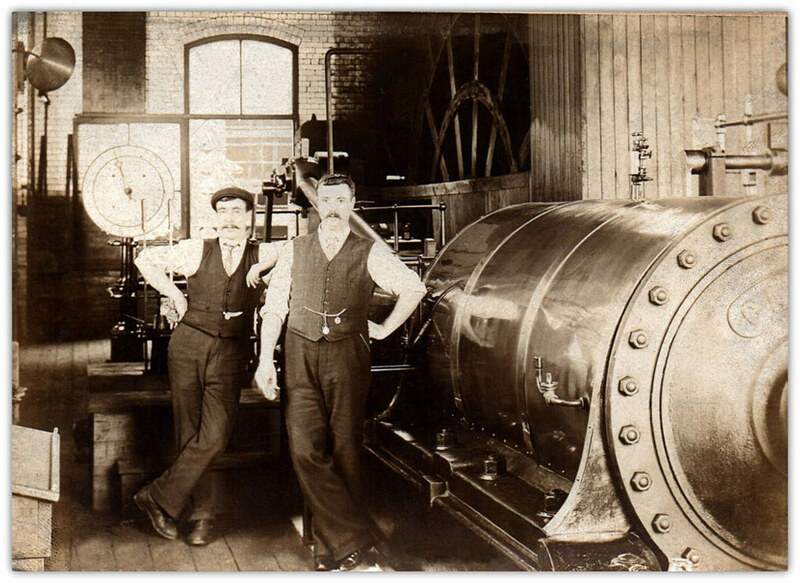 The No1 engine house at Warsop with John Henry Riley to the left and Robert Corner to the right. Engine No1 was called 'Capital' (the Shirebrook side), and Engine No2 called 'Labour' (Warsop side). Riley started work at the colliery aged 16 and worked there for 49 years and began as a winding engineman at 22 years old, a job that was to last 43 years. At one time he held the record for coal turning at 72 runs to the hour from the 450 yards deep shaft. He was known as Harry but mostly by his nickname 'Shell Fire Jack'. His brother James lived at The Rocks, Warsop Vale, starting as a surface boy, he became Washery plant foreman and later Pit bank Manager. Mr A Machin was Manager at the pit at that time. Further housing was built at Church Warsop in 1926 and is always referred to as ‘Scab Alley’ because many strike breakers were housed there. The free coal was not supplied during the strike and many scavenged for small coal on the colliery tip. Later an overhead ropeway using tipping buckets was installed. The system was replaced later by dump trucks and as with all collieries following the Tips Act of 1969 layer tipping would be done using scrapers. Pithead baths to cater for 2,576 men at a cost of £21,000 were opened on 8 Aug 1934 by N Dennis Turner Managing Director of the Staveley Coal and Iron Co. Prior to that the miners had to bathe in the tin bath at the front of the fire where their pit clothes were put on the range around the coal fire to dry and air in readiness for the next shift. The colliery was re-developed in 1935 as stall working ceased and conveyor faces were installed and reorganised again in 1953. In 1947 Warsop was allocated to No2 Area of the NCB with HQ at Mansfield Woodhouse. 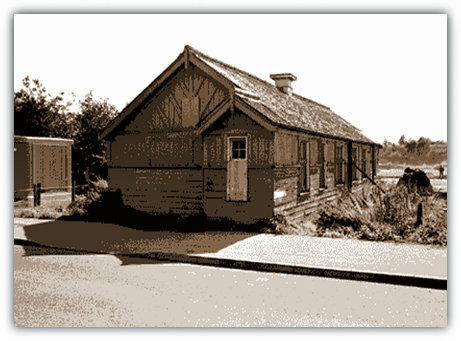 In 1949 after the first NCB reorganisation it was transferred to No3 Area with HQ at Edwinstowe until 1967 and on the next major reorganisation from April 1967 although a Nottinghamshire pit, it became a unit of North Derbyshire Area. There were always arguments regarding union matters, as Warsop was in the Derbyshire Miners Union, although it was a Nottinghamshire pit. 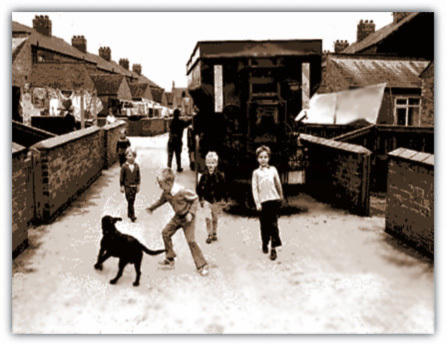 The village of Warsop Vale was built by the Staveley Co to house the workforce, just simple rows of terraced housing called Moore houses at £40 each, North Street being the main entrance to the pit off Carter Lane. The village housing was redeveloped in 1961. The Manager lived at Rock House that stood imposingly some few hundred yards away off Carter Lane towards Church Warsop and behind it at Rhein o' Thorns was a row of stone cottages built for the other 'gaffers', Undermanager, Overman etc. The Manager lived in the end cottage but could not see the pit from there so he persuaded the company to build the new house. There was a public house called 'The Vale Hotel' on the main road and was referred to by the locals as 'the Swing'. This hostelry was conveniently situated for the miners to slake their thirst. A Welfare Club was built opposite the terraces with all the facilities of a mining village such as sports etc. Up until the 1950 / 60s about a dozen ponies were still employed underground and among them were Silver, Rock a carthorse, Star, Titch, and a small Welsh pony named Ting. The ostler was particularly protective of Ting and rarely sent him out to work due to his small size. In the 1920s the ostler was R Buckland who had several horsekeepers, W Buckland, J Chilton, M Stray and G Harding. H Sansom and B Hawson were overmen. There was an overwind at No1 shaft on 22 Sep 1949 and the pit was stood all weekend. Output for that week was 11,458 tons. In 1947 the output was 576,428 tons with 1,685 men and in 1980-1981 highest tonnage was 922,797 tonnes with 1,386 men. The highest manpower under NCB was 1,683 in 1952. The maximum manpower was in 1926 when 3,237 men and boys were employed. Albeit that the colliery produced record tonnages during its early life it never managed to produce the magic million tonnes in a year. The colliery had steam winders at both shafts, with 2 tall brick chimneys for the boilers. The last chimney was demolished after 1964. Both shafts had winding engines made by Markhams of Chesterfield. At No1 shaft 8 tubs on 2 decks at 60 draws per hour and at No 2 shaft 4 tubs and materials and manriding. In 1952 a connection had been made from Warsop to Clipstone in the Top Hard seam, through the trough faults called the Clipstone drifts, and also to Shirebrook to enable a secondary access to be available during the reconstruction at Warsop when Koepe tower electric winders were installed in place of the steam winders using the traditional headgears. No1 tower was built around the existing headgear whereas No2 headgear was dismantled allowing that tower to be built and electric winders installed in 1956-1957. Both electric engines were AEI MG set drives and overhung direct coupled winder motors, GHH mechanicals (fully automatic coal skip winding from installation date and probably the first one in UK). Meanwhile whilst that shaft was shut for several months’ coal production was only at the one shaft and men and materials were also wound at that shaft. A new pit bottom at High Hazel level and a skip plant using 8 ton capacity skips fed via a short skip conveyor, vibratory feeder and initially a mine car tippler and diesel loco hauled with 4 ton mine cars used as rolling storage at No2 shaft. Eventually the 4 ton mine cars and tippler plant were replaced by a Butterley bunker for storage and the trunk conveyor extended to the pit bottom area. 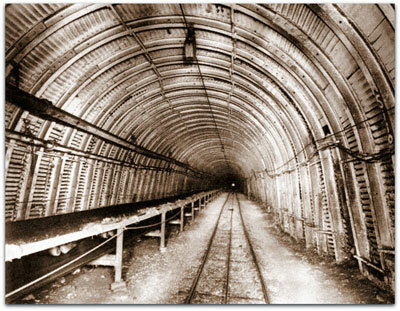 At No1 shaft 45 cu ft (1.27 cu m) capacity mine cars for dirt and materials were wound to and from the surface for all parts of the underground workings. On the surface new mine ventilation fans were installed and the existing Baum washing plant was refurbished and upgraded and a new Dense Medium processing plant was built giving a processing capacity of 400 tonnes per hour mainly destined for the CEGB (Central Electricity Generating Board) power stations, loaded out at the rapid loading merry go round train transport system. New offices were opened 1957. New pithead baths and lamp room were operational in 1964, new stores building and workshops 1965 / 66. A modern coal-fired boiler plant was installed in the late 1970s. Men / material rope road and monorail haulage, pit bottom pony loco haulage, pneumatic coal hoist 80 tonnes per minute run of mine to increase shaft capacity. Warsop being in the Derbyshire Branch of the NUM (since June 1899) although a Nottinghamshire pit came out on strike during the 1984 conflict and there was heavy picketing and the picture shows police checking cars at the pit entrance. Overall the Derbyshire miners voted against strike action but were overruled by the Area executive. However in 1985 after losing 200 men in an efficiency drive the output averaged 3,525 tons of saleable coal per day with a workforce of 1,320 giving a face o.m.s. of 9.55 tonnes and an overall o.m.s. of 2.95 tonnes. The output would continue to fall and the losses began to mount up.